1 C None No Power Seat 1 C is a standard Business Plus Class seat. The proximity to the lavatory and galley may be bothersome. 1 E None No Power Seat 1 E is a standard Business Plus Class seat. The proximity to the lavatory and galley may be bothersome. This seat is often referred to as a "honeymoon seat" as it is coupled with and faces the seat next to it. It is ideal for those passengers traveling with a companion. 1 G None No Power Seat 1 G is a standard Business Plus Class seat. The proximity to the lavatory and galley may be bothersome. This seat is often referred to as a "honeymoon seat" as it is coupled with and faces the seat next to it. It is ideal for those passengers traveling with a companion. 1 J None No Power Seat 1 J is a standard Business Plus Class seat. The proximity to the lavatory and galley may be bothersome. 11 A None No Power Seat 11 A is a standard Premium Economy Class seat that has extra legroom. The Exit Door protrusion and the proximity to the lavatory and galley might be bothersome. There is no floor storage during take-off and landing. 11 C None No Power Seat 11 C is a standard Premium Economy Class seat that has extra legroom. The proximity to the galley and lavatory may be bothersome. There is no floor storage during take-off and landing. 11 D None No Power Seat 11 D is a standard Premium Economy Class seat that has extra legroom. The proximity to the galley and lavatory may be bothersome. There is no floor storage during take-off and landing. 11 E None No Power Seat 11 E is a standard Premium Economy Class seat that has extra legroom. The proximity to the galley and lavatory may be bothersome. There is no floor storage during take-off and landing. 11 H None No Power Seat 11 H is a standard Premium Economy Class seat that has extra legroom. The proximity to the galley and lavatory may be bothersome. There is no floor storage during take-off and landing. 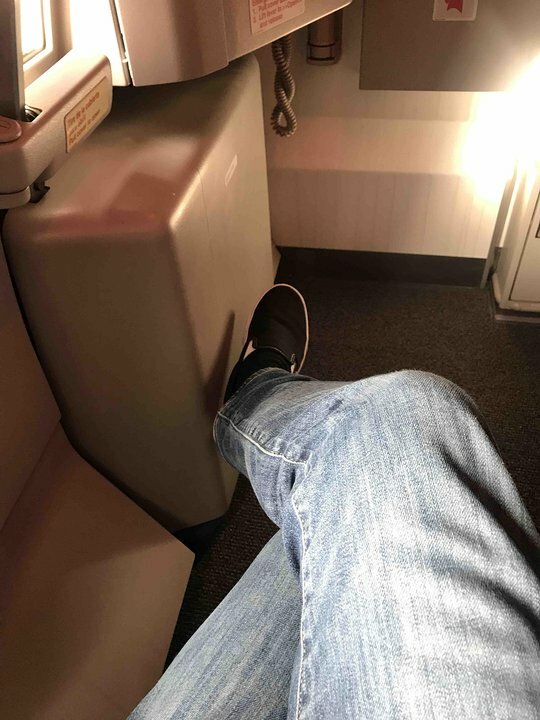 11 J None No Power Seat 11 J is a standard Premium Economy Class seat that has extra legroom. The proximity to the galley and lavatory may be bothersome. There is no floor storage during take-off and landing. 11 L None No Power Seat 11 L is a standard Premium Economy Class seat that has extra legroom. The proximity to the galley and lavatory may be bothersome. There is no floor storage during take-off and landing. 2 A None No Power Seat 2 A is a standard Business Plus seat. 2 L None No Power Seat 2 L is a standard Business Plus seat. 21 A None No Power Seat 21 A is a standard Economy Class seat that has limited legroom. 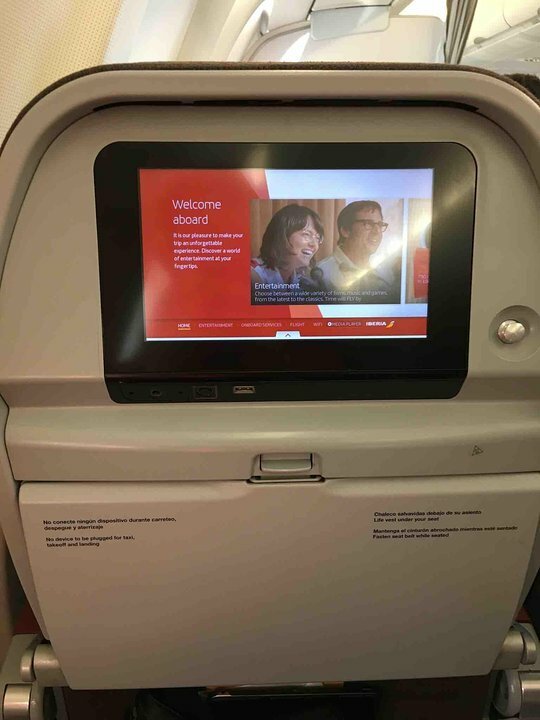 The tray table and inflight entertainment monitor are in the armrest, making the armrest immovable and slightly reducing seat width. There may be no floor storage during take-off and landing. 21 C None No Power Seat 21 C is a standard Economy Class seat that has limited legroom. The tray table and inflight entertainment monitor are in the armrest, making the armrest immovable and slightly reducing seat width. There may be no floor storage during take-off and landing. 21 D None No Power Seat 21 D is a standard Economy Class seat that has extra legroom. The tray table and inflight entertainment monitor are in the armrest, making the armrest immovable and slightly reducing seat width. There may be no floor storage during take-off and landing. 21 E None No Power Seat 21 E is a standard Economy Class seat that has extra legroom. The tray table and inflight entertainment monitor are in the armrest, making the armrest immovable and slightly reducing seat width. There may be no floor storage during take-off and landing. 21 G None No Power Seat 21 G is a standard Economy Class seat that has extra legroom. The tray table and inflight entertainment monitor are in the armrest, making the armrest immovable and slightly reducing seat width. There may be no floor storage during take-off and landing. 21 H None No Power Seat 21 H is a standard Economy Class seat that has extra legroom. The tray table and inflight entertainment monitor are in the armrest, making the armrest immovable and slightly reducing seat width. There may be no floor storage during take-off and landing. 21 J None No Power Seat 21 J is a standard Economy Class seat that has limited legroom. The tray table is in the armrest, making the armrest immovable and slightly reducing seat width. There may be no floor storage during take-off and landing. 21 L None No Power Seat 21 L is a standard Economy Class seat that has limited legroom. The tray table is in the armrest, making the armrest immovable and slightly reducing seat width. There may be no floor storage during take-off and landing. 34 D None No Power Seat 34 D is a standard Economy Class seat that has limited recline due to the lavatory behind. The proximity to the lavatory may be bothersome. 34 E None No Power Seat 34 E is a standard Economy Class seat that has limited recline due to the lavatory behind. The proximity to the lavatory may be bothersome. 34 G None No Power Seat 34 G is a standard Economy Class seat that has limited recline due to the lavatory behind. The proximity to the lavatory may be bothersome. 34 H None No Power Seat 34 H is a standard Economy Class seat that has limited recline due to the lavatory behind. The proximity to the lavatory may be bothersome. 34 J None No Power Seat 34 J is a standard Economy Class seat that has limited recline due to the lavatory behind. The proximity to the lavatory may be bothersome. 34 L None No Power Seat 34 L is a standard Economy Class seat that has limited recline due to the lavatory behind. The proximity to the lavatory may be bothersome. 35 A None No Power Seat 35 A is a standard Economy Class seat that has limited recline due to the lavatory behind. The proximity to the lavatory may be bothersome. 35 C None No Power Seat 35 C is a standard Economy Class seat that has limited recline due to the lavatory behind. The proximity to the lavatory may be bothersome. 36 D None No Power Seat 36 D is a standard Economy Class seat that has extra legroom due to the exit however, the proximity to the lavatories may be bothersome. The tray table is in the armrest, making the armrest immovable and slightly reducing seat width. There may be no floor storage during take-off and landing. 36 E None No Power Seat 36 E is a standard Economy Class seat that has extra legroom due to the exit however, the proximity to the lavatories may be bothersome. The tray table is in the armrest, making the armrest immovable and slightly reducing seat width. 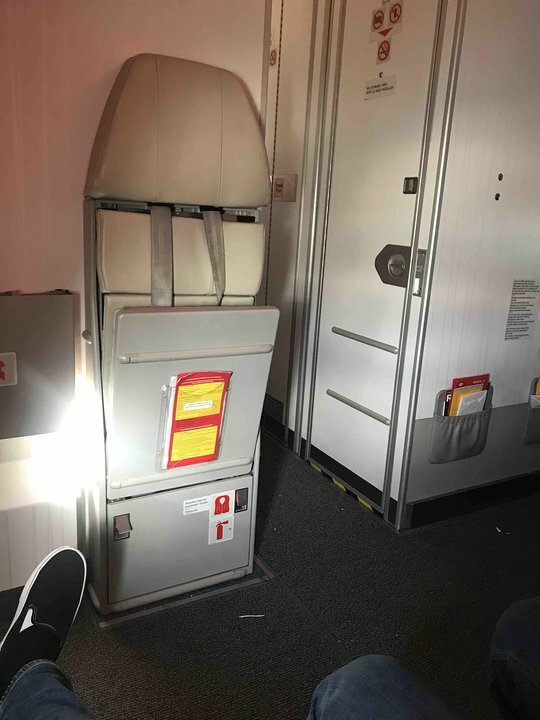 There may be no floor storage during take-off and landing. 36 G None No Power Seat 36 G is a standard Economy Class seat that has extra legroom due to the exit however, the proximity to the lavatories may be bothersome. The tray table is in the armrest, making the armrest immovable and slightly reducing seat width. There may be no floor storage during take-off and landing. 36 H None No Power Seat 36 H is a standard Economy Class seat that has extra legroom due to the exit however, the proximity to the lavatories may be bothersome. The tray table is in the armrest, making the armrest immovable and slightly reducing seat width. There may be no floor storage during take-off and landing. 37 A None No Power Seat 37 A is a standard Economy Class seat that has extra legroom due to the exit however, the proximity to the lavatories may be bothersome. The tray table is in the armrest, making the armrest immovable and slightly reducing seat width. There may be no floor storage during take-off and landing. 37 C None No Power Seat 37 C is a standard Economy Class seat that has extra legroom due to the exit however, the proximity to the lavatories may be bothersome. The tray table is in the armrest, making the armrest immovable and slightly reducing seat width. There may be no floor storage during take-off and landing. 37 J None No Power Seat 37 J is a standard Economy Class seat that has extra legroom due to the exit however, the proximity to the lavatories may be bothersome. The tray table is in the armrest, making the armrest immovable and slightly reducing seat width. There may be no floor storage during take-off and landing. 37 L None No Power Seat 37 L is a standard Economy Class seat that has extra legroom due to the exit however, the proximity to the lavatories may be bothersome. The tray table is in the armrest, making the armrest immovable and slightly reducing seat width. There may be no floor storage during take-off and landing. 4 A None No Power Seat 4 A is a standard Business Plus seat. 4 L None No Power Seat 4 L is a standard Business Plus seat. 48 H None No Power Seat 48 H is a standard Economy Class seat that juts out into the aisle and is often bumped into by passengers and crew. 51 C None No Power Seat 51 C is a standard Economy Class seat, however, the proximity to the lavatory and galley may be bothersome. 51 D None No Power Seat 51 D is a standard Economy Class seat, however, the proximity to the lavatory and galley may be bothersome. 51 H None No Power Seat 51 H is a standard Economy Class seat, however, the proximity to the lavatory and galley may be bothersome. 51 J None No Power Seat 51 J is a standard Economy Class seat, however, the proximity to the lavatory and galley may be bothersome. 52 A None No Power Seat 52 A is a standard Economy Class seat located in the last row of the aircraft. Seat back recline might be limited due to the wall of a bulkhead directly behind. Also, if the seat back in front is reclined, then there will be a reduction of personal space. The proximity to the galley and lavatory area might be bothersome. 52 C None No Power Seat 52 C is a standard Economy Class seat located in the last row of the aircraft. Seat back recline might be limited due to the wall of a bulkhead directly behind. Also, if the seat back in front is reclined, then there will be a reduction of personal space. The proximity to the galley and lavatory area might be bothersome. 52 D None No Power Seat 52 D is a standard Economy Class seat located in the last row of the aircraft. Seat back recline might be limited due to the wall of a bulkhead directly behind. Also, if the seat back in front is reclined, then there will be a reduction of personal space. The proximity to the galley and lavatory area might be bothersome. 52 E None No Power Seat 52 E is a standard Economy Class seat located in the last row of the aircraft. Seat back recline might be limited due to the wall of a bulkhead directly behind. Also, if the seat back in front is reclined, then there will be a reduction of personal space. The proximity to the galley and lavatory area might be bothersome. 52 H None No Power Seat 52 H is a standard Economy Class seat located in the last row of the aircraft. Seat back recline might be limited due to the wall of a bulkhead directly behind. Also, if the seat back in front is reclined, then there will be a reduction of personal space. The proximity to the galley and lavatory area might be bothersome. 52 J None No Power Seat 52 J is a standard Economy Class seat located in the last row of the aircraft. Seat back recline might be limited due to the wall of a bulkhead directly behind. Also, if the seat back in front is reclined, then there will be a reduction of personal space. The proximity to the galley and lavatory area might be bothersome. 52 L None No Power Seat 52 L is a standard Economy Class seat located in the last row of the aircraft. Seat back recline might be limited due to the wall of a bulkhead directly behind. Also, if the seat back in front is reclined, then there will be a reduction of personal space. The proximity to the galley and lavatory area might be bothersome. 6 A None No Power Seat 6 A is a standard Business Plus seat. 6 L None No Power Seat 6 L is a standard Business Plus seat. 7 C None No Power Seat 7 C is a standard Business Plus Class seat, however, the proximity to the lavatories and galley may be bothersome. 7 E None No Power Seat 7 E is a standard Business Plus Class seat, however, the proximity to the lavatory and galley may be bothersome. This seat is often referred to as a "honeymoon seat" as it is coupled with and faces the seat next to it. It is ideal for those passengers traveling with a companion. 7 G None No Power Seat 7 G is a standard Business Plus Class seat, however, the proximity to the lavatories and galley may be bothersome. This seat is often referred to as a "honeymoon seat" as it is coupled with and faces the seat next to it. It is ideal for those passengers traveling with a companion. 7 J None No Power Seat 7 J is a standard Business Plus Class seat, however, the proximity to the lavatory and galley may be bothersome. 8 L None No Power Seat 8 L is a standard Business Plus Class seat, however, the proximity to the galley may be bothersome. 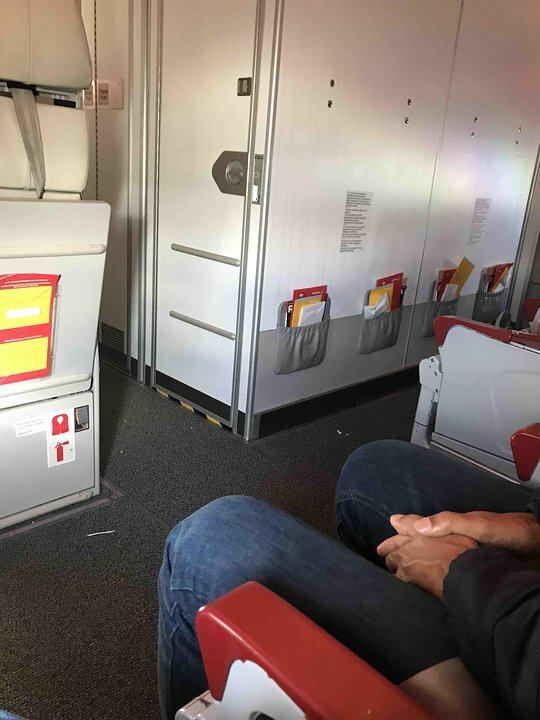 This aircraft operates on long-haul routes with 29 Business Plus Class seats, 21 Premium Economy Class seats and 242 Economy Class seats, which Iberia refers to as Tourist Class. All the flat-bed seats in Business Class have direct access to the aisle. The seat is great, but the service on board is far from good. The flight attendants just disappeared after the main service and showed up again before landing for the snack service. The configuration of the business cabin is not really smart. Both bathrooms are on the same side, so if you are sitting on J or L, you would have to be crossing galleys all the time. The passenger on our flight that sat in 11B would agree with the comment before mine. He was not pleased. However, in 11L were I was placed it was a great seat. Plenty of legroom and easy to get up if the person next to you was watching TV. Service was OK on Iberia, but it was better if they were not coming around all of the time because people wanted to sleep. Flight from Madrid to Chicago. Seats were not bad on the rear end, need a cushion after about 5 hours on a 9.5-hour flight. The seats also have a recliner for your legs and a footrest you can layout. Seat 11A and C and all bulkhead PE seats are not good seats. The 2 row seats have a curtain that separates the Business class and the crew goes thru them continually throwing the curtain all over you. The crew continually walks across the middle of row !! to get to the other side waking everyone up. It was like being n a hospital being woken every 30 minutes so they could serve Business class. Size of seat like Lufthansa PE but service no where as good as Luft.